Happy Birthday To My Brother That I admire! 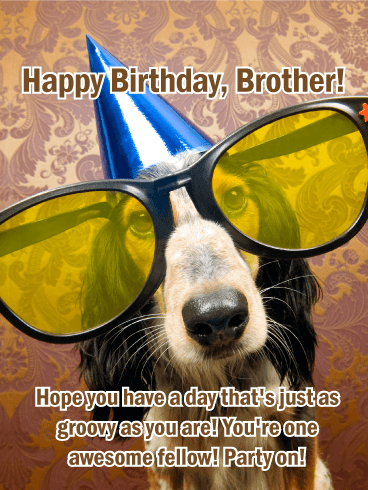 - Have an exceptional birthday and a sensational year, my dear brother. Childhood memories are worth holding on to, especially when they include your brother. This birthday card showcases an endearing image of a brother and sister walking hand in hand. So special! It will surely bring back fond childhood memories of the two of you. 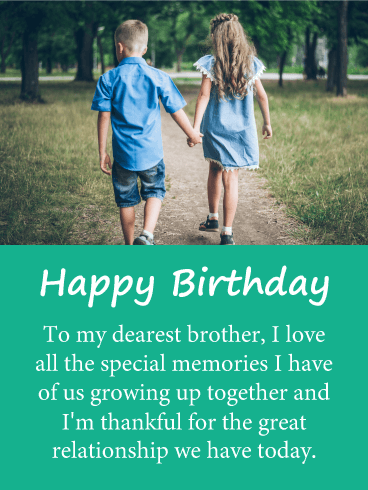 The special birthday message expresses to your brother that you are thankful for the great relationship you have with him today. 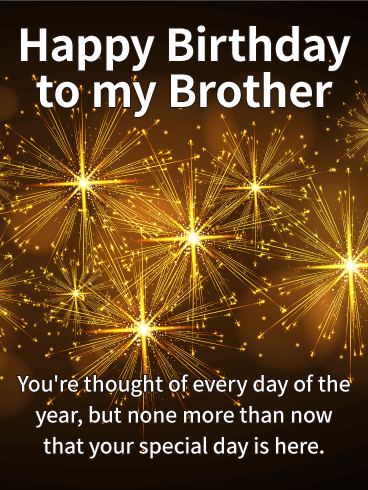 Send this touching birthday card to your brother today! There's just something about brothers and cars! 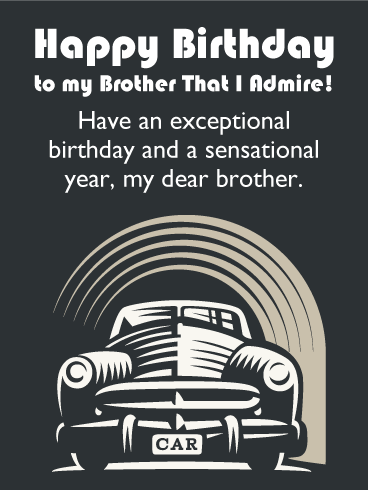 For the car-loving brother in your life, this simple, snazzy birthday card is definitely the way to go. 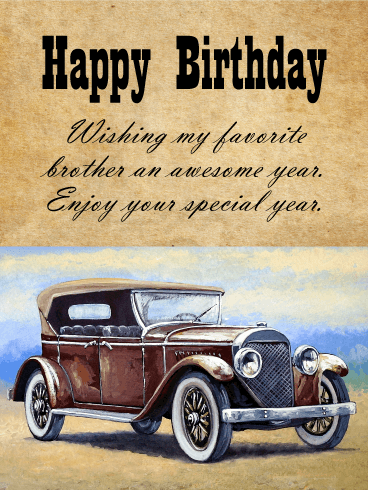 The background pattern is fun without being too flashy, while the old-fashioned car adds a vintage element to the birthday card. Wish your brother a happy birthday with this gem, and he’s sure to love it! When your brother was born, your parents got a bundle of blue balloons. That might have been a long time ago, but that doesn't matter because as we get older family gets more important. 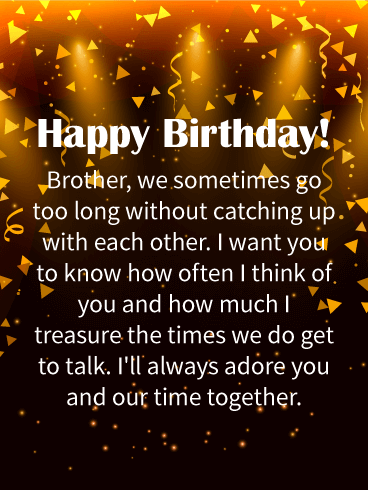 On his birthday, let your brother know how much you love the blessing that he is in your life. This birthday card is filled with a plethora of baby blue balloons and a message of love on a darker blue background. He's always on your mind, but his birthday is a special day indeed. 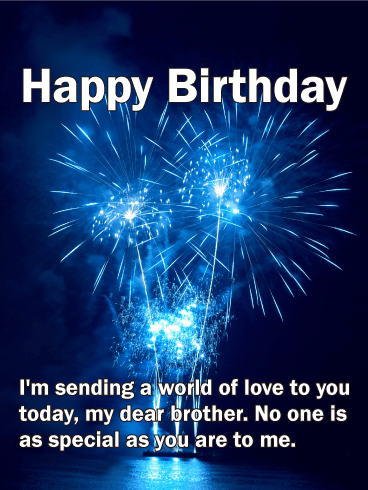 Let your brother know how special his birthday is today. This birthday card is set on a night sky of back illuminated with tons of stars bursting forth with golden light. It's the perfect card to let him know that he's as unique as each single star in the sky. You grew up with him, and you've spent your life with him. You've seen each other through all of life's ups and downs. He's your brother, and you couldn't be more proud of him. 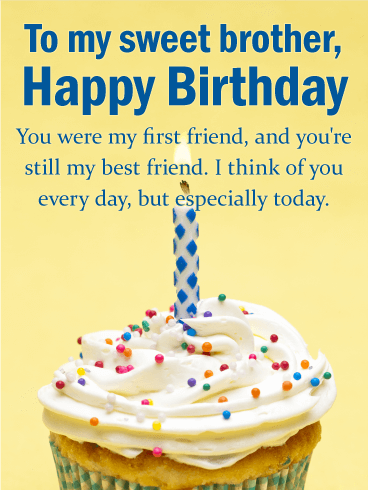 Tell him so with this birthday card. 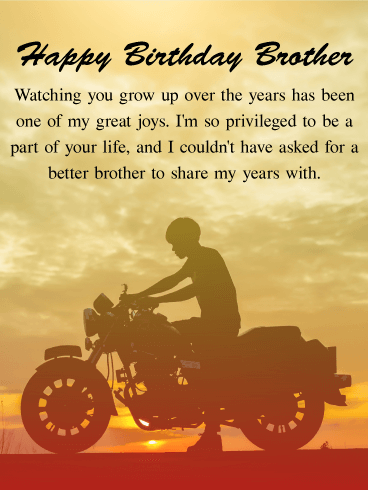 Reminiscent of him riding a motorcycle on during a beautiful sunrise, this birthday card's touching message for your brother is set on the golden and orange background of the sky at sunrise. 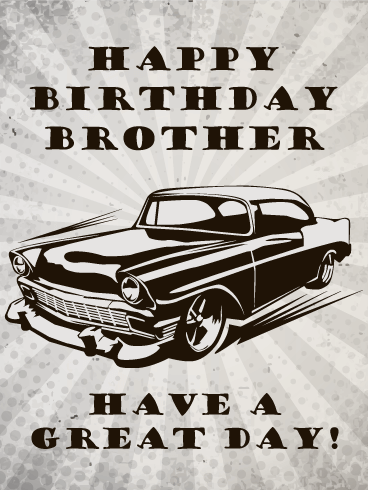 For the brother who loves cars-or simply enjoys things that are out of the ordinary-look no further than this fabulous birthday card. The old-fashioned car adds a unique element with great artwork, while the card itself offers a sweet sentiment. 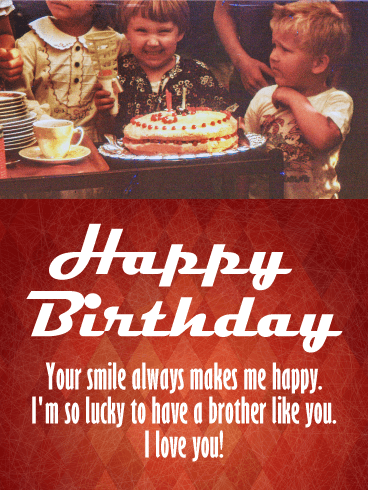 Wish your brother a great birthday with the ultimate style, in the form of this awesome birthday card. Sometimes we simply go too long without talking to our closest relatives as life interferes with our plans. That doesn't mean we don't think of them often. Tell your brother how much the time you do spend talking to each other means to you. His birthday is the perfect opportunity to tell him how much he means to you. This birthday card is a visual celebration of his birthday with confetti falling through stage lights right through your birthday message. This birthday card is the perfect mix of sweet and humorous. The throwback picture on the top half is a subtle way of telling your brother you still remember all the embarrassing things he did as a child, while the bottom half offers up a sweet sentiment sure to bring a smile to his face. If you're looking for a birthday card to let your brother know how much you love him, this is a can't-miss! An entire display of fireworks wouldn't be enough to show your brother how much he means to you on his birthday. He's been a guiding light in your life, and today is the perfect day to let him know as you send him a world of love. In this birthday card, the night sky is ablaze with blue fireworks bursting forth as they reflect over a body of water. 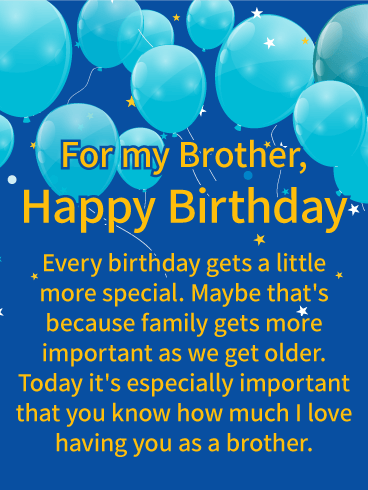 It's time to truly celebrate your brother's birthday! The scene is set with drinks and limes. With this birthday card it looks like you and your brother are all set to have a real party for two. 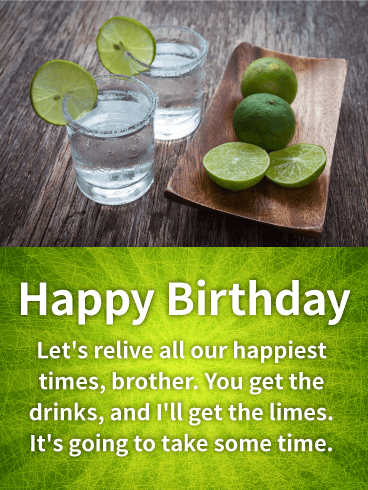 A background of a lime green starburst sets off your birthday message from the picture of drinks and a bowl of limes on a wooden table above. This absolutely is a birthday card your brother will enjoy!